U.Dance is an annual festival of the best youth dance companies throughout the UK and held in a different city each year. This year it was Salford's Lowry Theatre acting as host for this three day event which sees three showcase performances on the main stage on the evenings of 8 - 10 July and has various other exhibitions and pop-up performances happening around the building too, as well as workshops and masterclasses for the dancers. I was lucky enough, and indeed privileged enough to be able to see just one of the three evenings showcase performances. I really wish time would have allowed me to have seen all three though, since, knowing nothing about the U.Dance Festival prior to tonight, I was utterly wowed by what I saw and didn't want the evening to end. There is one 'problem' I have with the title 'youth'. I am of an age when this word was what a person was before they were an 'adult'. You 'came of age' either at 21 or at 18, (that's still something which is unclear), but one thing for certain was that once you entered the adult world, you were in no way, a 'youth'. My personal thought would be that once you no longer were a teenager you stop being a 'youth'. However it was abundantly clear that this evening the term 'youth' stretched a little further and we were asked to understand the term to refer to young adults too. I believe anyone up to and including 25 years is eligible to belong to a Youth company. I would therefore prefer the term 'Young' to replace 'youth' but still, maybe I am being a little picky. However that still doesn't answer the unasked question of the lower age limit; and if judging by these evening is anything to use as a yardstick, then I would say 11 or 12. But this age was most definitely in the minority tonight. Most were middle to late teens and older. In this evening's programme we were treated to 12 companies, and each and every one was absolutely fantastic; the energy, creativity and skill of these young performers was quite phenomenal. Let me make one thing clear here. I am in no way qualified to comment on the technical side of their dancing. If I am honest, then I do not even know into which 'category' the dances fell. I am aware of tap, hip-hip, jazz, country, etc; but most if not all the dances this evening fell into what I would categorise as either 'contemporary dance' or 'contemporary ballet'. And again, in my layman's understanding of these terms then I would say the difference is that 'ballet' has a more open and obvious through-line and is more accessible to an audience in terms of understanding the narrative, as opposed to 'dance' which explores an idea or emotion and is more internalised and has no obvious through-line. But again, maybe I a completely wrong! It would be wrong to try and critically compare the 12 items in tonight's show. All are from different backgrounds and starting points. All I can do is very briefly give a little information about each and a personal opinion. And of course it will be a personal opinion. Dance, just like all Art is totally subjective, and perhaps dance, more than anything provokes a feeling, a gut emotion, somewhere deep inside. It is primeval and it is instinct. Mankind has always danced, and the way in which we respond to movement is extremely interesting. So I can only give my own personal response to each piece. The first company to tread the boards of the Lowry theatre's main Lyric Theatre stage this evening was 'Momentum Youth Dance' from Yorkshire, and their piece entitled, Under My Skin. All I can say about this piece and these dancers is WOW. Choreographed by Alex Bowen, they left me utterly breathless. Momentum is the performance arm of the students of CAPA College in Wakefield. Let me tell you something right here and now, having never heard of this college before, nor this performance company, I am going to look out for more events from you in future. Wakefield is not too far away, so I will hopefully be able to follow you a little more closely in future and come to some more of your events. The style, grace, theatricality and panache used to create your ballet this evening - not to mention the death-defying leaps! - were executed with a grace and ease worthy of the highest praise. I have seen many a professional company fair much worse. I have become an instant and complete fan! Incredible! Next up was a group from the North East (Newcastle and Sunderland). 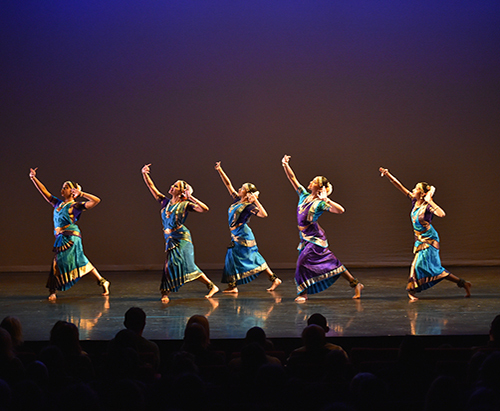 8 girls in traditional Indian costume performed a contemporary take on the traditional Indian Bharatanatyam dance form. The group call themselves Kalanitethan, and choreographed by Neelima Thampy, this was a piece called Thillana. Interesting. Since my background is acting, and having studied the theatre-form known as 'Physical Theatre' then I found the next group of dancers to have created something really quite interesting. Starting out as individual conversations to an unseen partner this developed into movement and shapes. Using their own internal rhythms and a technique known as complicite they danced without music. Personally I don't think this idea was developed far enough - but maybe that's because I am an actor, not a dancer. However, what they did was extremely good and professional, as well as entertaining, and was choreographed by Theo Clinkard. The company was Shift (the senior youth dance company of The Place) from London. Versus Dance Company from the East Midlands came next. They performed a piece called To Cause To Become choreographed by Adele Thomas and Daisy Moorcroft in collaboration with some of the dancers. Again, a really excellent idea and premise. The use of space and shape in this piece very well thought through. It was also the first piece this evening in which the lighting became part of the dance and integral to it. I loved the use of shadow here. Almost Shakespearean and grandiose in its intent, starting with a fencing dual, and ending with a sword death, Requiem Of Youth was Youth Dance Tyneside's offering and the next number to be performed. Danced extremely well by perhaps some of this evenings youngest dancers, it was lovely to watch and performed well. Choreographed by Anthony Lo-Giudice, it used the dancers skills to their best advantage. The penultimate piece before the interval saw another East Midlands dance company perform. This time though Tammy Tsang , from Nottingham, chose to present a pas-de-deux called Coming Home. Choreographed by Tammy Tsang and danced by Hannah Adams and Aldane Salmon, this was a most welcome adagio ballet piece after the frenetic and multi-cast dances seen previously. Reflective and tragic; honest and imaginative; this told a story and we empathised with it. Stunning. And so to the final dance before the short interval. Entitled A-Live Replay this was something a little special. I quote the programme here, "Wheelfever Projects is a Plymouth-based inclusive dance company that provides creative activities and artistic experiences for disabled and non-disabled young people. The performers enjoy making dance and finding new and exciting ways to move together as a dance company." Using a film projected on a screen behind them , the dancers, two of them in wheelchairs, came onstage and moved and danced along with the film, filling it out further and complementing it. What a lovely idea, and how amazing to see young people with disabilities overcoming them as best they can and finding a release and enjoyment in something everyone else simply takes for granted. Wonderful. After the interval we came back to witness the whole event's only participants from outside England. [if this is a UK festival then maybe they should about being a little more inclusive in future.... Wales and Northern Ireland are part of the UK too!] However, being a Scot myself I was proud and happy to think that England would now see us dance something that wasn't in a kilt and to bagpipe music! The National Youth Dance Company Of Scotland, choreographed by Anna Kenrick performed a contemporary dance piece called Maelstrom. This started out excellently and I could see the maelstrom forming before my eyes. However, the piece changed styles and music several times throughout making it more of an amalgam of a few separate pieces, which not only made it quite disjointed but also overlong. I didn't understand the premise that this piece explored, examining "the invisible personal invasions in this media-driven, online-obsessed world", but they did dance it extremely well. Shorter and more exciting though would have stimulated me more. But hey! Meal do naidheachd an Alba!! Next up was a group of some very young boys from B2. A dance company formed from students 7 - 13 years from Sir William Borlase Grammar School in Marlow, Buckinghamshire. Inspired by the video game Assassin's Creed, they all wore hoodies and played killers and victims in a short but excellently put together piece of choreography by Josh Bojarzin and Kisrty Ashby, called, quite naturally, Assassin. So wonderful to see an all male dance troupe and so talented, so young! The next young company to come bouncing onto stage - oh no, sorry they came on tramping - was the youth dance company Dance 2 Advanced, which is the youth arm of professional dance company Two Thirds Sky, and are based in Northampton. Choreographer Laura Gibson, in collaboration with the dancers created a rather stunning piece of theatre. Yes, theatre. Once again, using feet to create beat and rhythm, the pulses coming from within, this was a very organic piece of dance, more in-line with many physical theatre practices than with classical dance. Innovative and very entertaining. One Is A Big Number was the title of Impact Youth Dance's offering. This group of young girls from London were I think amongst the youngest performing this evening, but sadly, for me at least, it was the least enjoyable and came across too as perhaps the least coordinated. I THINK they were supposed to have spelled something with neon letters on their backs at both the beginning and end of this piece but I couldn't make any sense of the either letter grouping unfortunately. One of the smallest girls did do some bodypopping (I think that is the term) to the delight of the youths in the audience and I did like some of the ideas and shapes created by their choreographers Hakeem Onibudo, Keanu Wilson and Anita Parris. And finally, the evening was brought to a close by locals. After travelling far and wide across the nation we finish with the fantastic Ludus Youth Dance Company from Lancaster performing their Encore. I am still waiting to see what the actual dance was... but their Encore was phenomenal! I first was made aware of this company about 40 years ago when I saw them perform a piece called The Qube. It was an adult professional company at that time, and since then have gone on to develop and diversify and are now one of the north west's leading dance training and performance establishments. This evening was no exception at all. These talented youths under the choreography of Gary Clarke made a wonderfully theatrical and comical finale to the evening's events. With a line of chairs across the back of the stage, and the company dressed waist up in male evening wear, and boxer shorts from waist down; with white painted faces with a splash of rouge and red lipstick, you knew straight away that this was going to be something quite extraordinary. And it was. It was a throw-back or maybe even homage to an earlier era of musical entertainment - Cabaret, or perhaps Music Hall, and this was not only excellently danced, with split-second timing to make the arm pictures work to perfection, but it was also the only dance this evening which featured comedy, and used it to great effect. Combine this with some beautifully designed lighting, and a group of committed and talented youths to deliver it, and I really did want an encore! A complete theatrical performance! And then suddenly the stage was completely full. All the dancers from all the companies performing this evening came back on stage - not quite sure how they all managed to fit - to dance together as a wonderful celebration of the talent, creativity, commitment, dedication, skill, and sheer energy of the nation's youth dancers. Bravi, bravi bravissimi tutti!! To find out more about U.Dance and the ongoing opportunities they provide for young dancers, information can be found by going to www.u-dance.org or on Facebook at facebook.com/onedanceuk, or on Twitter at either @onedanceuk or @youthdance.